A corpus of vernacular narratives about the biblical King David survives from early medieval Ireland. These narratives are written in early Middle Irish, and can therefore be dated roughly on linguistic grounds to the tenth century. 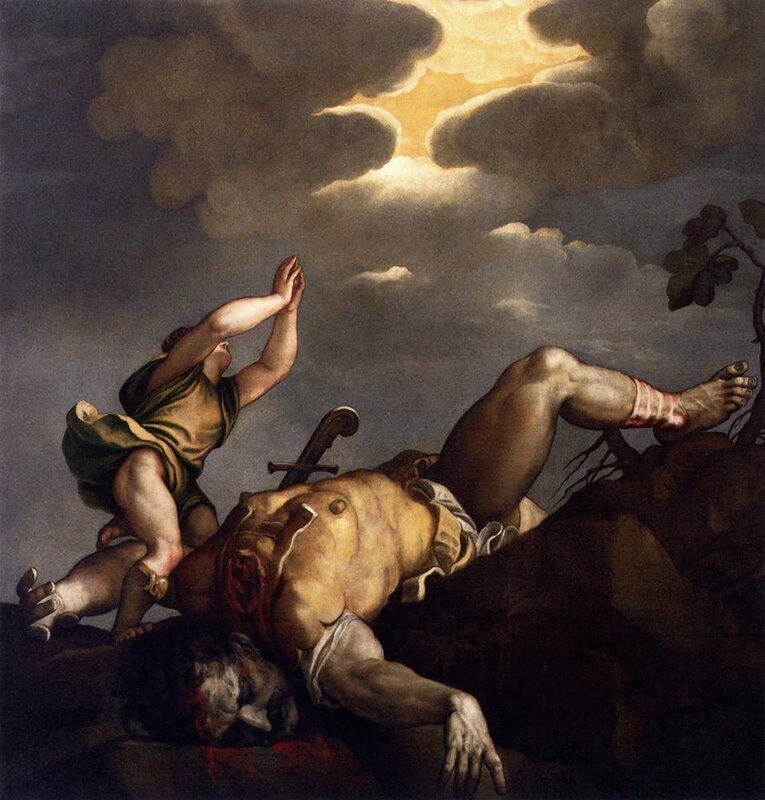 One of the narratives – a vernacular reworking of the story of David and Goliath – survives only in the Yellow Book of Lecan. It was edited by Kuno Meyer in his ‘Mitteilungen aus irischen Handschriften’, but as far as I know has never been translated into English. I offer below an English translation, along with Meyer’s text (with some minor corrections and adaptations). What is notable about the narrative is the way that it subtly reshapes its biblical source in order to make it more reminiscent of early Irish saga narrative, and particularly narratives recounting the deeds of Cú Chulainn. One might argue that the author is fashioning a macgnímrada (‘boyhood deeds’) of David, to parallel those of Cú Chulainn. For example, the action is relocated from a plain, as in the biblical narrative, to a ford, Cú Chulainn’s preferred site of combat in Táin Bó Cúailnge (‘The Cattle-Raid of Cooley’). And, rather than decapitate Goliath, as described in the account in the book of Samuel, David smashes Goliath’s head in with his shepherd’s crook, which is described in a manner which recalls Cú Chulainn’s hurley, and which thus reminds the reader, not only of Cú Chulainn’s killing of the hound from which he took his name, but also his ‘driving the brains out’ of various opponents in the Táin. Indeed, aspects of this text support the idea that Irish saga narratives should be read using the exegetical techniques of biblical interpretation, since the author(s) of the Irish David narratives draw(s) out his typological function, and, in the following narrative, gesture towards a typological function for the character of Cú Chulainn himself. The style of the text is comparable to that of many other Irish narratives of similar date, being short and largely dialogue-driven, with a fairly minimal narratorial voice and relatively little in the way of description (in contrast to the adjective-laden texts of the twelfth century and later). Dauīd mac hIsse, rī is ferr tarraid talam intī Dauīd. Is ē dorōne na trī cōeca[i]t do molad Crīst, as ē romarb Gōla trēnf*er do F*ilistīnib i n-aimsir Saūil maic Ciss rī[g] thūaithi Dē mac nIsraēl. Ba hamnus īarum cathugud frisin nGōlaii .i. secht cuba[i]d a mēit, cathbarr cīrach for a chind, lūirech īaraind imbi, cōica cēt di un*gaib indi, īallaccrand umai imma chosaib, claideb n-īaraind ina lāim. Cōica fer cach lāi nomarbad do thūaith Dē ar galaib ōinf*ir. Hesse didiu athair Dauīd, is ē robo comairlid do S*aaūl. Nothēigtis īarum rechtaire Saūil do chuindchid thrēnf*ir ar cind // n*Gōlai. Gilla and siden in Daūid oc a chāirib. ‘Cid nothēigid?’ ar Dauīd frisna rechtaire. ‘Is ed so adrubairt mac Esse’, ar in rechtairi fri Saūl. ‘Mac bōeth’, ar sē ‘7 ōinmit. Is airi doradus-sa dom chāirib do theasairc in gilla sin ōn dūad sin. Tēit neach ar a chend.’ Tēit nōnbur chuici. ‘Regaid-se am āenur’, or sē. Tēit leo. ‘Cīa hen*gnam dorignis rīam?’ or Saūl. ‘Drocharm i n-agaid trēnf*ir’, ar a athair. Tēit īarum ar a chend isin n-āth. Dobeir Dauīd cloich ina thabaill, ruslēic ’sin n-aēr. Roacht in cloch a torand oc teacht sūas. Dēchaid Gōla sūas. Rolā in cathbarr dia chind, dochuredhar in cloch ina ētan co mbāi a medōn a cloicne. Imrid īar sin in camōic for a chend co nderna brūar de. Cētchomlonn Dauīd sin. Íar sin rofōcrad ō Saūl co ndechaid for loinges airet robūi Saūl a mbeathaid, conid īar n-ēgaib Saūil rogab son rīghi mac nIsraēl. Finit. David son of Jesse; the best king who ever came to earth was the same David. It is he who made the three fifties to praise Christ; it is he who killed Goliath, champion of the Philistines, in the time of Saul, son of Kish, king of the people of God, of the children of Israel. Fighting against Goliath was rough, then, i.e. seven cubits his size, a crested helmet upon his head, an iron breastplate around him – five thousand ounces in it – bronze greaves around his legs, iron sword in his hand. Each day he used to kill fifty men of the people of God in single combat. Jesse, then, the father of David, it is he who was a counsellor to Saul. Saul’s stewards, then, were going to seek a champion against Goliath. At that time, David was a lad shepherding. ‘Where are you going?’ said David to the stewards. ‘This is what the son of Jesse said’, said the steward to Saul. ‘Silly boy’, he said, ‘and a fool. The reason I put him to my sheep was to save that boy from that challenge. Let someone go to him.’ Nine men go to him. ‘I will go indeed’, he said. ‘What valorous deed have you ever done?’, said Saul. ‘Bad weapons against a champion’, said his father. He [i.e. David] goes then against him in the ford. David puts a stone in his sling; he shot it into the air. The stone made its noise while going up. Goliath looks up. It put his helmet from his head; the stone struck his forehead so that it was in the middle of his skull. After that he [i.e. David] plies the crook upon his [i.e. Goliath’s] head so that he made fragments of it. That was David’s first combat. After that he was proscribed by Saul so that he went into exile as long as Saul was alive, so that it is after the death of Saul that he took the kingship of the children of Israel. Finit. Or this sentence could be spoken by Jesse (David’s father). Literally: ‘it took a sheep of the sheep’.